After weeks of public inaction on a host of smoldering policy controversies, Republicans at the North Carolina General Assembly unveiled a new and controversial bill yesterday afternoon that addresses several high-profile issues. The new legislation, which was negotiated and written behind closed doors by and at the direction of House and Senate leaders, was made public in a contentious joint House-Senate Appropriations Committee meeting that featured several rancorous interactions between Republican defenders and Democratic critics of the bill. The meeting also featured, among other things, a withering interrogation by Republican lawmakers of Governor Cooper’s new chief lobbyist, Lee Lilley. Lilley who only joined the Governor’s staff earlier this week, was asked several pointed questions about his knowledge of the agreement that the Cooper administration negotiated with Duke Energy and Dominion Energy as part of its approval of the controversial Atlantic Coast Pipeline project. In the agreement, the companies promised to underwrite a $58 million “mitigation fund” to, in part, alleviate some of the negative impacts of the pipeline on surrounding communities. Prior to joining the Governor’s staff, Lilley worked for McGuire Woods Consulting, where Dominion was one of his clients. If there was a single most controversial aspect to yeste rday’s meeting and discussion, however, it was the decision to combine so many disparate subjects into a single, omnibus bill – a move that was clearly designed by Republicans to box the Governor and Democratic legislators into a difficult political position. While the bill includes a “fix” for the widely unpopular K-3 class size mandate – a provision that Democrats (and many Republicans) have long demanded – it also includes several provisions that will clearly be unacceptable to Cooper and the Democrats. This includes provisions that seek to direct the disposition of the pipeline mitigation fund (something Cooper has claimed as his prerogative) and a redo of the legislature’s previous effort to combine the State Board of Elections and State Ethics Commission into a single agency. A recent ruling for the state Supreme Court struck down lawmakers’ previous merger efforts as unconstitutional. Senate and House K-12 leaders announced details of the class-size chaos fix at a press conference Thursday afternoon, rolling out a four-year, phase-in plan for the deal and $61 million in recurring funding for “enhancement” teachers—arts, music, world language and physical education teachers. The deal is said to retain the “status quo” for class sizes in the upcoming 2018-2019 school year. Advocates hope it will offer long-term assurances to head off the partisan clashes on K-3 classrooms that have dominated the last two years at the legislature. Lawmakers say they arrived at the deal after weeks of closed-door negotiations over the fate of North Carolina’s K-3 mandate, which began in 2016 when GOP legislators ordered local school districts to slash class sizes in the early grades. Some Republican budget writers said they sought smaller classrooms, but a wave of criticism from Democrats, local districts and public school advocates urged action before school systems were forced to cough up millions or lay off potentially thousands of arts, music and P.E. teachers. The bill includes a dedicated funding stream for enhancement teachers, Republicans said. And while the “core” classroom teacher allotment will be restricted to that use, the enhancement teacher allotment can also be spent on classroom teachers, Barefoot said. Members of a joint legislative budget committee approved the GOP-authored legislation—which includes a plan to relax some eligibility restrictions for Personal Education Savings Accounts—Thursday afternoon. Of particular import: The bill strips the requirement that an eligible recipient must have been a full-time student in a public school. The controversial program provides a debit card for families of children with special needs to spend on private school enrollment. The North Carolina Supreme Court recently struck down a General Assembly law merging the State Board of Elections and State Ethics Commission, and lawmakers are trying to pass a fix before heading back to the lower court. House Bill 90 also adds one seat to the State Board of Elections and Ethics Enforcement for someone who is not affiliated with either of the political parties with the most registered affiliates. That means the Board would consist of four Republican members, four Democratic members and one unaffiliated member. Cooper can appoint all nine members of the new board — eight from a list of names compiled by the majority parties and one from a list of two names compiled by the other eight appointed members. “The purpose of this legislation is to implement the decision of the North Carolina Supreme Court … to give the Governor executive control over the Bipartisan State Board of Elections and Ethics Enforcement and to provide for representation on the State Board by unaffiliated and third-party voters,” the bill states. Cooper’s office didn’t comment specifically on the election part of the bill but released a statement about the whole measure. “It’s clear that the legislature finally bowed to public pressure on class size and expanding Pre-K, which is positive for our students, but it’s unfortunate that it has been lumped in with political shenanigans,” said spokeswoman Sadie Weiner. Another aspect of HB 90 addresses $57.8 million in funding from Dominion Power and Duke Energy that was announced last week in tandem with the Department of Environmental Quality’s approval of a key Atlantic Coast Pipeline permit. Governor Cooper’s office wants the fund to be used for environmental mitigation initiatives. Funds can also be used to ensure that local communities benefit economically from the pipeline by having access to natural gas from the pipeline, according to Cooper’s office. But Republican legislators have labelled it a “slush fund” for the governor and want to earmark the money for the school districts in the eight counties impacted by the future pipeline. 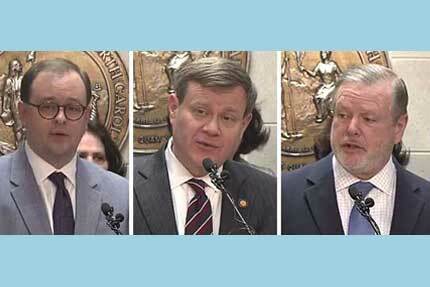 Look for more heated debate as the legislature begins voting on the omnibus bill today. Coming-up this afternoon Policy Watch environmental reporter Lisa Sorg will have much more on the mitigation project’s Memorandum of Understanding (MOU) and the grilling of Governor Cooper’s new legislative director.